One of classical music's most influential figures for the 20th century, Leonard Bernstein was born to Jewish immigrants and raised in Boston, where he attended both the Garrison and Boston Latin schools. His musical training began on the piano and his first attempts at composition were made at a young age, although he initially faced the opposition of his middle-class parents in the pursuit of such a frequently-unrewarding career. It was while attending Harvard that Bernstein was given his earliest opportunity to undertake what would eventually become the primary source of his fame, when he assumed the role of conductor for some incidental music he had composed for Aristophanes’ The Birds. After Harvard he studied piano, conducting and orchestration at the Curtis Institute of Music, as well as attending the Boston Symphony Orchestra's Tanglewood Institute. At the age of only 25 he landed an assistant conductor's position with The New York Philharmonic, and after serving as a last-minute replacement for a performance (and associated radio broadcast) at Carnegie Hall in 1943, the demand for his talents took off like a bat out of hell. 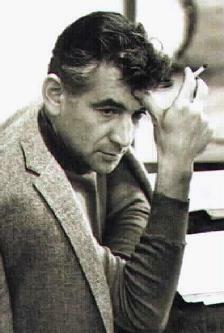 The following year, Bernstein publicly established himself as a composer with the premier of Symphony No. 1: Jeremiah, performed by the Pittsburgh Symphony Orchestra. Also in 1944 was the premier of the ballet Fancy Free, created in collaboration with choreographer Jerome Robbins; such was its success that its authors were inspired to adapt it into a Broadway musical, and before the year was over On The Town was packing in audiences. A two-year tenure as music director of the New York City Symphony Orchestra was initiated in 1945, after which followed various conducting assignments, including events in Tel Aviv and Milan, as well as extensive teaching work at Tanglewood and Brandeis University. By 1956 Bernstein had landed a contract with the Columbia Masterworks label, with whom he remained extremely productive until a move to Deutsche Grammophon in the 1970s. The peak of his career was to arrive in 1958, however, when he assumed the directorship of the New York Philharmonic: a position that was subsequently maintained across 11 years, nearly 300 recordings, and countless performances. It was with the NYP that he created his popular Young People's Concerts, a musical series broadcast on CBS that endured for fourteen seasons. Over the course of his career, both Bernstein's output and impact were enormous. In addition to works for orchestra and ensemble (Prelude, Fugue and Riffs (1949), Mass: A Theater Piece for Singers, Players and Dancers (1971), and Concerto for Orchestra: Jubilee Games (1989) amongst them), he composed two operas (Trouble in Tahiti (1952) and A Quiet Place (1983)), two additional ballets with Robbins after Fancy Free (Facsimile (1946) and Dybbuk (1975)), a film soundtrack for On The Waterfront (1954), and four Broadway scores in addition to On The Town (Wonderful Town (1953), Candide (1956), his best-known work West Side Story (1957), and 1600 Pennsylvania Avenue (1976)). Both On The Town and West Side Story were adapted into feature films, with Story earning an Academy Award in 1961. Four books of Bernstein's writings on music were published between 1959 and 1982, and a lecture series at Harvard in the early 1970s was both televised and transcribed. Honors and awards of ridiculous variety were piled upon the conductor from sources all around the globe. Some of the more notable events in the later decades of Bernstein's career were centered around humanitarian concerns. On the 40th anniversary of the atom bomb in 1985 he staged the Journey for Peace, realized with the European Community Youth Orchestra on a tour that included performances in Athens and Hiroshima. In 1987 he established a fund to benefit Amnesty International in memory of his wife Felicia Montealegre, having been a long-standing supporter of the organization. A series of "Berlin Celebration Concerts" were staged by the conductor during the dismantling of the Berlin Wall at the close of 1989, which featured musicians from all of the nations associated with the original partitioning. In the final years of his life, his focus remained on his role as an educator, and he established counterparts to the Tanglewood Institute in Europe and Japan -- the latter being inaugurated just months before his death.